QUEBEC CITY: The French-Canadian student accused of killing six people during evening prayers in a Quebec City mosque had rented an apartment nearby, neighbors said yesterday, a sign he may have been targeting the house of worship. Alexandre Bissonnette, 27, was charged on Monday with six counts of first-degree murder and five counts of attempted murder with a restricted weapon after Sunday evening’s massacre at the Centre Culturel Islamique de Quebec. Police said he acted alone. The mass shooting, which was rare for Canada and which Prime Minister Justin Trudeau called a “terrorist attack,” prompted an outpouring of support for the mosque and for the country’s 1 million-strong Muslim community. Authorities in Quebec have called for a spirit of inclusivity and police have tightened security at all religious institutions in the province. Bissonnette, who said he was a fan of US President Donald Trump and far-right French politician Marine Le Pen, had moved into an apartment in the beige block near the mosque in July and drove a Mitsubishi truck, said a neighbor, who asked not to be named. Another neighbor on the fourth floor never spoke to Bissonnette but frequently heard him playing the piano. A neighbor of his parents told the Canadian Broadcasting Corp he had lived in the apartment with his twin brother. 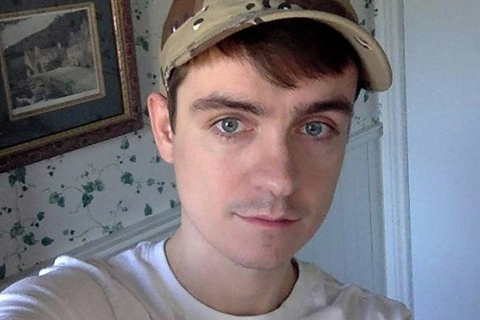 Police declined to discuss a motive for the shooting, but friends and online acquaintances told Canadian media that Bissonnette had expressed anti-immigration sentiments, especially toward Muslim refugees. Vigils were held in Quebec City, Montreal and other cities on Monday evening. The large turnout showed people rejected hate speech and wanted to be inclusive, Quebec Premier Philippe Couillard said. “I think it’s a turning point for Quebec, to see people rallying around values like that,” he told reporters in Quebec City, the provincial capital, yesterday. “Our society is not perfect. No society is perfect … racism, xenophobia and exclusion exist here. We have to recognize that and act together to highlight the path we want society to take,” Couillard said. Bissonnette did not hide his hostility toward Muslims during his long interrogation by police, Montreal’s La Presse newspaper said, quoting a source close to the investigation. He was also interested in guns, and practiced shooting at a local club near the provincial capital, La Presse reported. Police have not released specific details of the weapon used in the attack, other than to say it was a restricted firearm. A social science student and former cadet known in online circles for his right-wing views, Bissonnette was described by a former classmate as a “nerdy outcast”. Bissonnette made a brief appearance in court on Monday under tight security. Prosecutors said all of the evidence was not yet ready, and Bissonnette, a student at Universite Laval, was set to appear again on Feb 21. No charges were read in court and Bissonnette did not enter a plea. His lawyer, Jean Petit, declined to comment at the courthouse on Monday. Quebec’s public safety minister, Martin Coiteux, said security at all religious institutions across the province had been heightened, particularly at mosques. He added that while police always treated reports of religious harassment and hate speech seriously, they had not always done a good job of letting communities know the results of their probes. “We will pay particular attention to feedback,” he told yesterday’s news conference. In Montreal, Quebec’s largest city, police were increasing their presence at mosques and other Muslim institutions and watching for possible hate speech online. “When you have an incident like the one in Quebec, people are worried … we will maintain a very high level of vigilance,” the city’s police chief, Philippe Pichet, told French-language public broadcaster Radio-Canada. Both law enforcement and intelligence agencies in the United States believe the suspect was sympathetic to right-wing nationalist ideology, and that this was likely a major factor in his motive for the attack, US officials said. On his Facebook page, Bissonnette indicated he liked Le Pen, Trump, the separatist Parti Quebecois, as well as Canada’s leftwing New Democratic Party, the Israeli Defense Forces, heavy metal band Megadeth and pop star Katy Perry.